Well I don’t know how the weather is where you live, but today it’s raining and cold here in North GA, and less than 24 hours ago I was out on my road bike in shorts and short sleeves enjoying sunshine and seventy degrees! I am just amazed at how that can happen. I wanted to reach out to you all today to share some exciting news that we have coming out of the Run for God camp. Many of you through the years have shared your incredible stories with me. Some of your stories have been ones of extreme lifestyle changes, health improvements, weight loss, a reconnection with the Lord, and even marriages being reinvigorated. These stories always have a common theme, they always involve a lesson that God taught you. I am always at a loss for words when hearing how God can use a ministry, that teaches people such a simple discipline, to radically change their life. These stories are inspiring, motivational, and should be given a platform so that others can learn and be inspired from them. I’ve often wondered how this could be done, and I think that lately the Lord has been showing me the answer to that very question. I want to introduce you to “Devotions”. Devotions will be just what the name says. 52 weeks of stories that will inspire, motivate, and encourage runners of all levels. 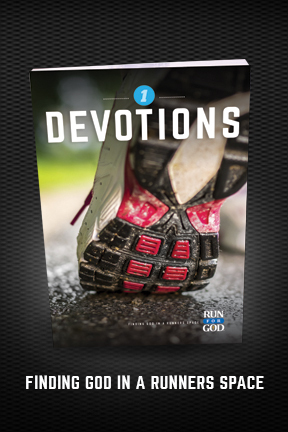 Run for God was founded on a 12-week Bible Study that parallels faith and endurance. Whether it be a 5K, 10K, or Half-Marathon, we have a Bible Study for you that can be done in a group setting, and that will not change. But “Devotions” is something very different. This will be a yearly personal study that will be packed full of Real Life experiences that you can enjoy all year-long. Along with this study will be training plans of all common running distances as well as our answers to the 52 most common running questions. A Title – Sum up your story in 30 characters or less. Scripture – 3 passages that explain how God tied your story to His word. That’s it! Once we get your story we will review it and possibly use it in one of three places. Some will be used for our motivational post series, others may be used for blog contributions, and the 52 that our panel feel will make the most impact on readers will be published in the all new “Devotions” series that is slated to release in 2015. If your story is chosen to be published in the “Devotions” series, you will receive 10 copies of the book, once published, at no charge. Again, please consider sharing! We all have a story. Your story is powerful and may be just the thing that someone else needs to hear! YOUR STORY IS POWERFUL AND MAY BE JUST THE THING THAT SOMEONE ELSE NEEDS TO HEAR! How many have you gotten so far? Would be nice to get a progress report. Ken, as of today 5/13 we have received 45 submissions. These stories are great! Finishing my submission, thank you for the inspiration, please advise on whether there is a deadline?